The Fit to Drive Campaign is meant to encourage adults ages 65 years and over to consider difficult transportation choices as their driving ability declines with age, and to suggest using public transit as a way to remain independent and mobile. 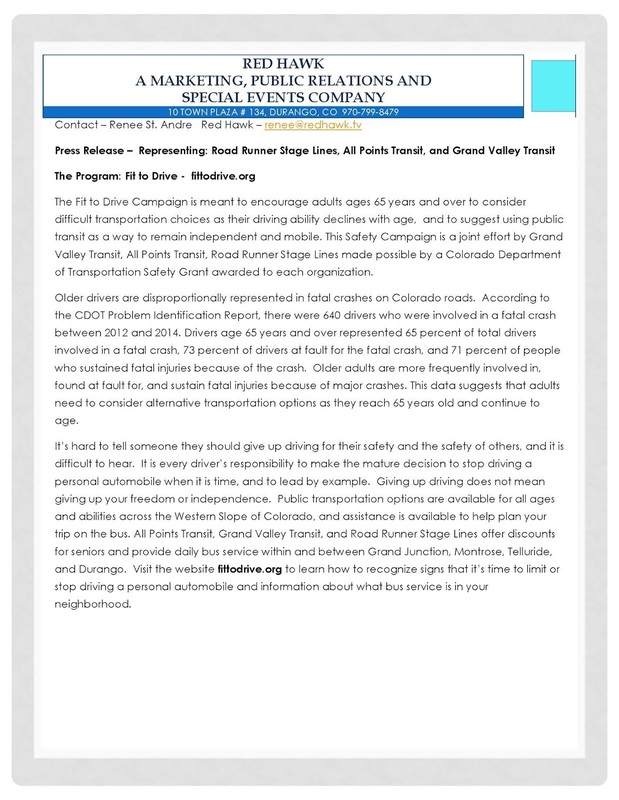 This Safety Campaign is a joint effort by Grand Valley Transit, All Points Transit, Road Runner Stage Lines made possible by a Colorado Department of Transportation Safety Grant awarded to each organization. Older drivers are disproportionally represented in fatal crashes on Colorado roads. According to the CDOT Problem Identification Report, there were 640 drivers who were involved in a fatal crash between 2012 and 2014. Drivers age 65 years and over represented 65 percent of total drivers involved in a fatal crash, 73 percent of drivers at fault for the fatal crash, and 71 percent of people who sustained fatal injuries because of the crash. Older adults are more frequently involved in, found at fault for, and sustain fatal injuries because of major crashes. This data suggests that adults need to consider alternative transportation options as they reach 65 years old and continue to age. It’s hard to tell someone they should give up driving for their safety and the safety of others, and it is difficult to hear. It is every driver’s responsibility to make the mature decision to stop driving a personal automobile when it is time, and to lead by example. Giving up driving does not mean giving up your freedom or independence. 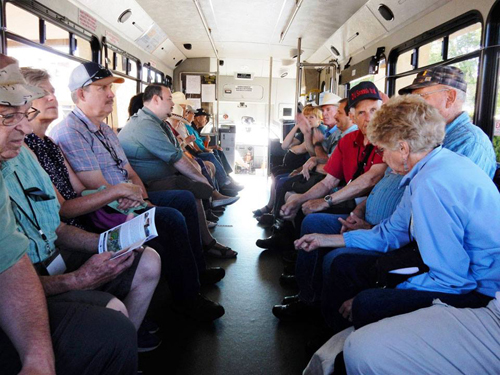 Public transportation options are available for all ages and abilities across the Western Slope of Colorado, and assistance is available to help plan your trip on the bus. 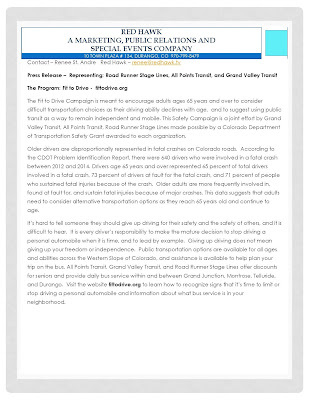 All Points Transit, Grand Valley Transit, and Road Runner Stage Lines offer discounts for seniors and provide daily bus service within and between Grand Junction, Montrose, Telluride, and Durango. Visit the website fittodrive.org to learn how to recognize signs that it’s time to limit or stop driving a personal automobile and information about what bus service is in your neighborhood.